Get your Bingo Admission Ticket Holders Here! Need something to hold your admission ticket or any keepsake? Check out our large selection of these great ticket holders. Many styles to choose from. Can't figure out what that special bingo player wants? Give them a Gift Certificate and let them choose exactly what they love! 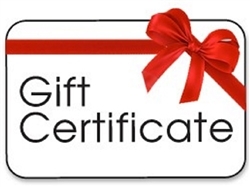 Just click the "Add To Cart" Button to place the Gift Certificate in your shopping cart. *You will choose the value of the gift card after you add it to your cart and select a delivery method (email or postal mail). Admission Ticket Holders – keeps your admission ticket in plain sight for the moment when you yell “BINGO”! Choose from a huge assortment of adorable styles and colors. Bingo Waiters – Make it easy to keep track of that one last number you need to win! These Bingo Waiters come in different styles and colors and will give you that lightening quick advantage that you’ll need to call out your win before someone beats you to it! Replacement Dauber Tips – If you need to replace a worn dauber tip, this is just the thing. Save time and money. Bingo Folding Board – Tired of gluing, clipping and taping all those bingo sheets? Need a better way to play? Here’s your answer. Play those cards, faster and much easier! Any many more gifts for bingo lovers, designed to personalize your bingo gaming experience. These bingo novelties also make perfect gifts for those bingo lovers in your life. So, whether it’s a cup or a mug, a keychain or a set of bingo calling cards, you’re sure to find that perfect bingo accessory that everyone at the bingo games will notice and ask about! Each available Bingo trinket is sold below the list price. This means that for every novelty item that you buy from CT Bingo Supply – you save! The more items you purchase, the bigger the savings. Why pay more?